18 in / 8 out USB 2.0 Audio interface with four Scarlett Mic preamps, 24bit/192kHz, 8 ADAT inputs, 4 line inputs. Best bang for the buck and beyond. Gave it 5 starts as my initial first few days has been a great experience. Hoping the product lives up to my expectations. An audio interface that I had tried a while ago. Excellent, practical, great quality and at an excellent price. Highly recommended. The sound quality of the 18i8 is excellent, the configuration in Mac is really easy, and works perfect with Pro Tools and Logic Pro. Amazing product. Sounds great. Is easy to use. Pretty much plug and play. I could not be more happy with the Scarlett 18i8! It performs perfectly right out of the box and is obviously a high-quality product that looks and feels incredibly well-made. I will be able to use this for all my musical needs for a very long time ~ I LOVE IT! 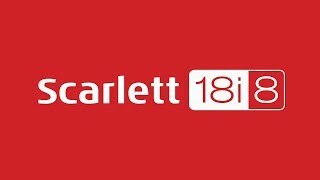 Antes de tener una Scarlett 18i8 yo ya había comprado una scarlett 2i2 y en lo general es una excelente marca, estoy muy contento con la compra. Great piece of kit. I had a 2i4 and needed some more outputs and glad I made the upgrade. Great sound and low latency. I have been a 18i6 owner for many years. The unit started to fail intermittently several months ago. Support was very proactive and worked with me closely to troubleshoot the problem. Excellent spec for the money. Build quality not quite as indestructible as I’d expected - a little lighter and thinner. Drivers seem unreliable (I’m on OSX 10.11) - the Focusrite Control software (v2.3.3) often struggled to recognise the unit, which is largely useless without configuration using that software. It seems to be a known issue as there is a lot on the web from people with similar issues. Focusrite support took a couple of days and sent me a PC older driver as a fix, which isn’t much use on a Mac! Industry standard interface for recording, bundled with useful software. I probably went for more than I needed but the price was cheap due to b-stock availability. Nice one. My Scarlett 18i8 arrived at my home pretty fast and in perfect condition. It works perfectly it's all I was expecting for the product. Great job! Amazing product! Easy configuration and excellent compatibility with Windows 10 and DAWs that i use like Ableton Live, Cubase and Pro Tools. Superb sound/ build quality. What else could you want of an interface?! It rules! Great sound and very easy to use! Excellent product. I was looking to expand the number of analogue inputs to cope with the growing number of hardware synth I seem to be getting and this fitted the bill at the right price. There was really another option like it without spending double! It will be useful to be able to add more inputs digitally in the future as well. The Focusrite Scarlett 18i8 (2nd Gen) is exactly what I needed. Solidly built, beautiful red, 4 powerful preamps. The perfect addition to my home studio. Not to mention the versatile Focusrite Control software which makes my recording experience that much simpler. I can see myself keeping this interface for years without any issues. All the knobs are well built and smooth, the extra headphone output a very convenient option to use. I would definitely recommend this interface for anybody. For the price, this is an absolute bargain! The capacity to now track live helps a lot. But there's sometimes clicks and pops while recording which can be very annoying. I used an 18i6 for 4 years and only upgraded to the 18i8 because I accidentally dropped and broke the USB output on my 18i6. This unit works flawlessly and is very easy to use. I like the 18i8 much better than the 18i6 due to its level overload rings and 4 front inputs. This thing sounds great with my Macbook Pro and Logic DAW. I create tracks for friends all over the world and use the 18i8 for vocals, drums, guitars, keys and virtual instruments. Anyone who loves creating music at any level should own an 18i8 for home studio work or on the road for spontaneous recording. Great price for a great little piece of gear! Big gang for your buck! Highly recommended. As an artist, producer, and engineer I proudly recommend Focusrite audio interface. One of the best usb hardware I ever came across and it delivers incredible sound. I dreamed of a well built audio interface to fit my needs but mostly in sound quality that's appeasing to my ears and believe me this is it. I love the perks that it has to offer as well. Thanks Focusrite for making such a great product. I love the Scarlett 18i8 2nd Gen. A true loyal custumer, LUologist from AllBreedEnt. Great product. Easy to see the quality of the materials used to build it. It will last forever. Plenty of connection options. I couldn't be more pleased with an interface. best mixer ever, perfect for my little home studio! Bought the 18i8 after my Tascam failed and have never looked back. From the moment I plugged it in it has worked perfect. Very high quality for a fair price. I highly recommend it for home studio use and live recording. Hello. This product did not work with windows 10. Had to return. Hope they fix the drivers. Really excellent update to an already good USB interface. The latency is excellent, below 3ms even when going via PC effects. The updated control panel is also simple to use, but powerful. It makes it a perfect choice for my live rig. Scarlett 18i8 (2nd Gen) is class compliant on Mac. Driver will be required for PC. Four combi inputs with Scarlett mic preamps and two newly-designed high headroom instrument inputs let you record any combination of instruments or vocals together. Connect your synths, keyboards or mixers into four additional line inputs on the rear panel, and connect any equipment with digital I/O to the SPDIF inputs to record ten simultaneous channels. Connect an OctoPre via ADAT, expanding to 12 mic preamps and 16 analogue inputs. Two discrete headphone outputs let you send separate headphone mixes to two artists, or an engineer and artist, while two balanced jack outputs let you connect to your professional studio monitors. With further MIDI connectivity, you can also integrate your favourite hardware synths with your DAW. The second generation Scarlett range is packed full of upgrades. New super-low latency* will bring confidence to your performance, letting you record and monitor with software effects in real time. New metal gain controls and a sleeker red metal chassis underscore its improved industrial design, built to go anywhere. The Scarlett range also now operates at sample rates all the way up to 192kHz, and the input channels have evolved too. The latest Scarlett mic preamp features a more even gain structure, so you can accurately set your levels, and the instrument input has also been completely redesigned with greater headroom to handle seriously hot guitar pick-ups. Finally, Focusrite have provided analogue protection circuitry across both the inputs and the outputs, to guard your interface against unwanted power surges.